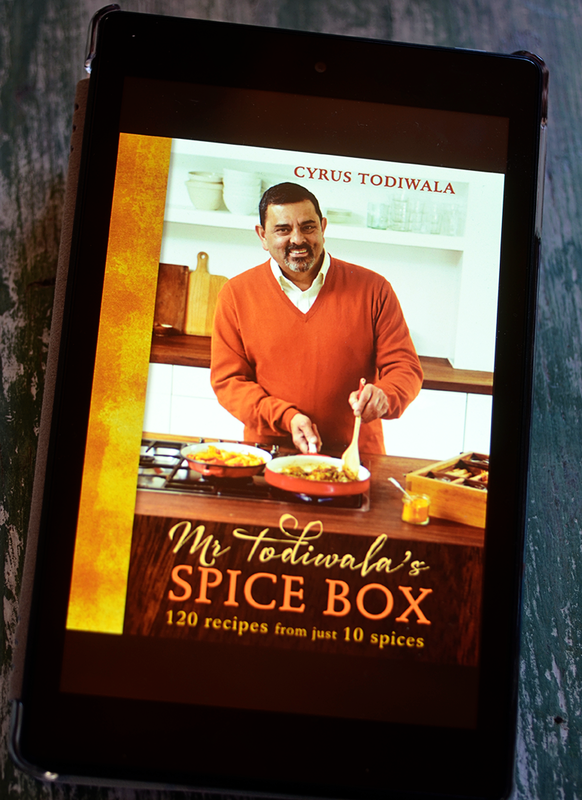 The book I've used is Mr Todiwala's Spice Box by Cyrus Todiwala. I have made a couple of small changes - in the book, the potatoes are cooked in the oven along with the fish and then they are placed under a grill to crisp the flesh. 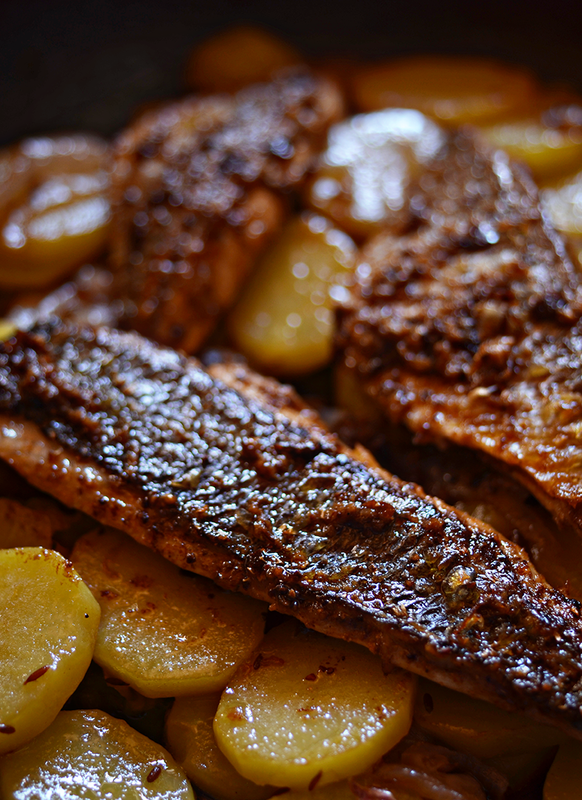 I've found that I got a great result cooking both the potatoes and the fish on the stove top - in the case of the fish, I find I have more control and a shorter cooking time on the stove top. Place the toasted coriander seeds into a mortar and crush, sprinkle in the chilli flakes and pound to break it down slightly. Place this into a bowl, along with the ground cumin, ginger & garlic paste and salt. Stir through the lime juice and olive oil - it should have the consistency of thickish cream. Place the butter into a large pan and melt over a medium heat - add the cumin seeds and garlic and sauté until the garlic starts to colour. Add the onions and sauté until starting to soften. Add the potatoes, along with a sprinkling of salt and pepper and stir them gently through. 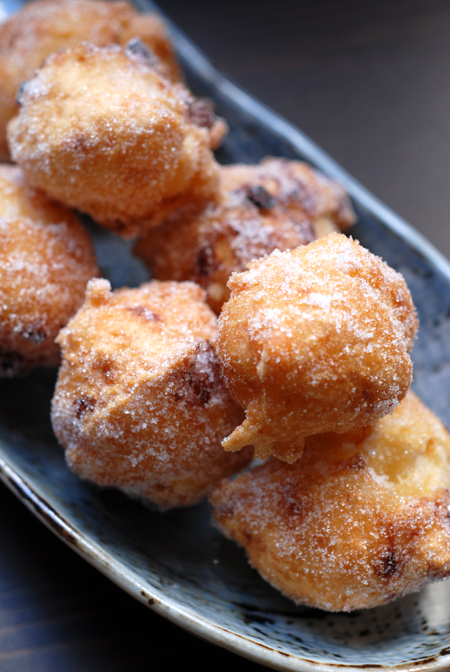 Cover the pan and cook for 5 minutes, before giving them a stir to turn them over. Repeat this until the potatoes have softened. At this stage you'll be ready to cook the fish - they will only take a minute or so. Increase the heat on the potatoes and add a little more butter - this will just help to finish off the potatoes and give them that lovely golden crust. Place the fillets into the masala mixture and let them sit for about 5 minutes - making sure both sides are well coated with the masala. Don't be tempted to keep them in for too long as the lemon will start to cook the fish. Put a little oil and another knob of butter into a large pan and place over a medium heat - once the butter has melted and is starting to sizzle, place the fillets, skin side down, gently into the pan. Press your fingers down on each fillet for 10 seconds to help stop the fish from curling and ensure an even cooking of the skin. Once the skin is crisp, turn the fillets over until cooked through. The time taken will depend on the thickness of the fillet - my fillets spend about 45 seconds on skin side and 30 seconds on the other. Place the potato mixture onto a serving dish and arrange the cooked fillets on top.